Adam Herman at Blueshirt Banter broke this down in significantly more detail than I can, and you should 100% check out his post here. When you think of a rebuild, you immediately think of prospects, developing those prospects, and putting these prospects in a position to succeed. It’s the only way a rebuild works. Sure, the elite level players don’t necessarily need a whole lot of grooming, but that’s a small percentage of the players that make a rebuild successful. Development is key. The majority of players will need at least a full season in the AHL before they get brought up to the NHL. And therein lies the biggest problem with the Rangers as an organization and the biggest question mark and wild card when it comes to this rebuild. The Hartford Wolf Pack are an absolute disaster. It goes beyond results on the ice. It’s a culture thing. Tobias’ tweet here is in reference to Ken Gernander’s days. It may be old, but there is a key line here that is frightening, and it was “We had a coach who just yelled at me.” Yelling isn’t teaching. Yelling is yelling. There is no actual coaching there. There’s also no evidence to show that the culture and environment created by the Gernander days has actually left the Pack’s locker room. But beyond the obvious, there’s a North American hockey culture preference that is ingrained in the coaches and front office staff. For the Rangers, it’s –meaning the inability to adjust to highlight a player’s strength, and forcing conformity– a key culprit in perhaps why the Rangers have lost several Euro players back to their respective Euro leagues. Calle Andersson is just one example. Michael Lindqvist is another. Perhaps we will see this happen again with Ville Meskanen, who by all accounts deserves a call up but hasn’t received one. Naturally this doesn’t apply to every prospect that goes to Hartford. The Blueshirts have seen their fair share of players get to the NHL. It’s also interesting to see Rangers prospects perform better in the NHL than in the AHL. Clearly LIbor Hajek is one example –albeit through one game– but we’ve seen Lias Andersson have significant questions about his game in Hartford, only to show he belongs in the NHL in his most recent stint. Tony DeAngelo is another who had “glaring holes” in his game in the AHL but has shown he belongs at the NHL level (took him a while though). Kudos to David Quinn and his work with DeAngelo, and Pavel Buchnevich. Players like Ty Ronning, Sean Day, and Ryan Lindgren have had significant struggles in the AHL. While they are not a guaranteed part of the future, all three have been looked at as potential depth players to fill out the roster. Their development, even into key AHL players to help grow an improved culture, could be critical to the future success of others that pass through. The Rangers seem to be content with ignoring glaring issues in Hartford. Did you know that as of 2017, the Rangers only had one goaltending coach, and that was Benoit Allaire? They’ve since hired a goaltending coach for the Pack. That’s just a microcosm of the issues noted above. This now falls on Keith McCambridge and Joey Mormina, the only coaches in the AHL right now. This is on Chris Drury to address their need for coaches who develop players and create a non-toxic environment. Because that’s what it is in Hartford right now. It is toxic. It needs to change. "The Rangers have a Hartford problem", 5 out of 5 based on 32 ratings. Disgrace, nothing else to say. Send a few veterans down and help straighten out the mess ?? Here’s the thing: Day, Gropp & Ronning have been much better after their time down East, even if the team ain’t doing that great. As I’ve written previously, the biggest problem *right now* is the lack of depth from 2014-2015 drafts. This is why they’re combing backstreets and alleys for guys to fill out the lineup. Another issue(which goes back to Germander) is that the need to teach them how to play in the NHL, not just play for the Rangers(this should be begun in Maine.) Learn em all the basic systems, play one way for 10 games, another the next 10 and so on until you figure out what’s best for the squad. Then stick with that the rest of the way. If the player is ready, bring him up for sheltered minutes on the 4th line/3rd pair. Next year? The players mentioned above will be a year stronger and experienced, there’s the possibility of a player like Virta coming over as a placeholder(can be a play driver as a middle 6 w/Ronning) and a rotation of Halverson, Georgiev & Shestyorkin won’t be half bad, but the forward Corp is still gonna be as shallow as the melted ice at the CL center come Good Friday. Who’s article? The one above, or Herman’s. For the latter, I take his writing with a bag of water softener salt. I’ve been watching Hartford play live and via streaming for a couple of years, always follow via game reports. Calle Andersson looked like a scrub in TC his 1st year compared to Skjei, was marginally better his 2nd TC. Look at the comment section during those tourneys to see real time reactions. Not sure I agree with a 10 game rotation on systems just to see what is best for the group. I don’t think the AHL is solely about wins/losses. It is about development and being prepared to play on the big club if/when they are called upon to do so. To that end, it would seem prudent that whatever coaching philosophy and system(s) are in place with the big club would be flowed down to the AHL. If both clubs are on the same page philosophically and play the same “systems” then the ability to bring someone up from the AHL can be more of a “plug and play” and less of a “trial by fire” moment. Despite early criticism from some, Quinn is not going there. Thus, IMHO, it would make more sense to follow as much as possible what Quinn is doing with the big club. I don’t disagree that there is value in finding out who can excel in different systems. But that value might be related more to who is a trade candidate, as it would seem if they cannot adopt through “teaching” to what Quinn is doing, then they are more likely to struggle than succeed. For the record though, I do not think a coach at the NHL level should adopt a system and shove it down the throats of his players if the skillsets of the players he has to work with are not a match. To me this is where AV failed…. 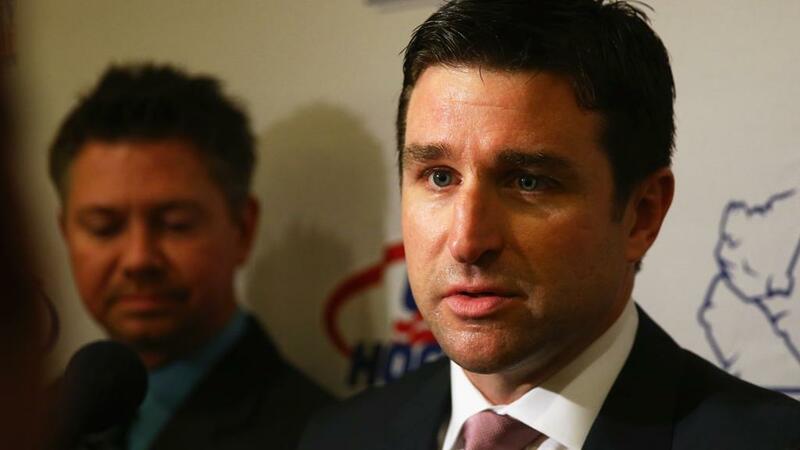 B: get them ready to play for the Rangers, with some of that instruction at the NHL level. If you “marinate” them at the AHL level for too long, you never get enough NHL games in them to evaluate progress before they become waiver eligible. Prime example, McIlrath. Secondary: Ryan Graves. How would I do it? With a junior eligible player(whom has looked good enough in camp), I’m avoiding 10 games played & 40 games on the roster. So it’s 2 games out of 5, then down to Hartford for a conditioning assignment for 2 weeks; rinse, repeat until junior evaluation camps occur, then if they make the U20, send them there. Then after WJC, you do 3 in 5, conditioning assignment, repeat at the start of February. If they miss the cut, return them to junior. By that point you either know they’re ready(so you can start looking at trades) or they’re ready to go back to junior where you hope they tear it up for the end of the season and the playoffs. The key is being up front in the process with both the player and their junior team from draft day. The team will know how to handle their roster construction in advance and look at the player returning as a post trade deadline addition that is an upgrade; the player will know that going up and down isn’t a negative opinion of them, but part of the process. they have a development issue, but its also a drafting issue. keep drafting guys with less pure skill but more grit, that’s the product you’ll get on the ice amongst the “kids”. not gonna point out specific players.. futile endeavor at this juncture. They keep running off the skill players. I could be way off but here it comes. The organization has finally come to the realization that you can’t buy a cup under a cap system, and that if your going to win, you need a good farm system. Having said that, we never had a decent farm system, never took the draft serious, and were always cavalier about going out and getting UFA stars, who are approaching the top of the hill, ready for a major decline. I’ve listed many so called stars who came to NY for that one last pay day. Those days should be gone for ever. They should fill in holes as needed, but not try to buy these guys that are old, and think they will deliver us to the promised land. The time has come to get some good teachers down on the farm, and teach the kids the right way to play the game!!!!!!!!! The only reason I’m mentioning this is someone posted the other day we should go after Karlsson this off season, and I said please stay away. He is too small, frail, and would cost a small fortune to sign, for a long term deal. I say don’t walk away from him, run like hell away from him!!!!!!!!!! I didn’t say that we should go after him, I said I think that the Rangers may go after him. Now that’s a low blow, LOL! FYI, I didn’t mention you by name, I forgot who posted it, so you may be onto something!!!!!! I said that the Rangers may have Panaarin and Karlsson on their radar this offseason. Never, but I can laugh with you!!!!!!! At last. Sunshine is a disinfectant. The bright light of scrutiny needs to be aimed at Hartford. Something is very wrong there and Drury better Do His Job and fix the place. I think it starts with McCambridge. What has he won? Does he have a plan? Who has HE developed into an NHL player? If you can not answer those questions ….how do you coach the top affiliate? Coach teams to both the Kelly and Calder Cup finals. Someone actually read the article! Yes, what in God’s earth is going on down there? I find it very interesting that all of these players who supposedly are stinking up the joint down there, seem to thrive when being called up. This is more then just not having enough talent. My suspicion is that the problem starts with Drury. What do we know about him actually except that he was a good hockey player and seemed to have some leadership potential. On the job results suggest poor aptitude for his current position. And he has no track record before this. Maybe he is learning on the job and will get the hang of it – then again, maybe he is just another one of these guys that Gorton and Father (Interesting spell check change from Sather) get along well with personally, see as a good team player, and hire. Anyone have any ideas which is true? Drury wears and has worn other hats in the FO and given his lack of experience perhaps took his eye off of what he was suppose to do in Hartford. Not sure though why you had to take a crap on Gorton who with the exception of Hartford is seemingly doing a pretty good job … and Sather, I mean please … it’s been a while since he had any real power over the day to day. I suspect he does more golfing and less advising than you might think. Why is he seemingly doing a pretty good job? For the record, he assumed control of a team that had been to the semi-finals of Stanley Cup two straight years and has won one playoff round on his watch. One may argue the futility was inevitable, but then why did he not see it coming? And what has he done exactly? Signed Brendan Smith, Kevin Shattenkirk, brought in the current Hartford regime, bought out Girardi , traded Ryan Graves for a player he did not even want– in short, numerous regrettable actions. Certainly the Zibanejad deal was brilliant, so we are not without bright spots. The jury is still out on the Stepan and McDonagh trades. And Quinn. I thought keeping Zuccarello was a no-brainer given what he got. When it comes to a rebuild like this one, we are really too early to evaluate how things are going. The truth is that both the glass half empty and glass half full people have plenty of stuff to back up their case. I am really not saying I think Gorton is doing a bad job. I just question the idea that the evidence says he is doing a good one. I also suspect that Sather has a certain amount of say in management personnel and basically none in player personnel. No money to be made up there. That is all MSG cares about. I am thinking that we need a new staff at Hartford aligned with Quinn. Choose coaches that follow the same philosophy so that when the make the NHL squad, they know what to expect. Not everyone there is prepping for the NHL, but for the 5 or 7 that are coming to the NHL, teach them the work ethic required. Teach, not yell. I can’t escape the feeling that Hajek was brought up just to get him outta there for a while. I am sure that is exactly right. It’s great… now it looks like we’re calling up players to the NHL to get them some proper development… or at least in the right environment. Not good at all! As stated a week or so ago, they need to clean house and bring in a true development coach down there. Wins are important for establishing the right culture but teaching is the key aspect of AHL play — and priority #1. I think we’ve all witnessed it here now with the current Rangers, we’re losing but playing well. Assessing Hartford is tough because there are so many players that who are not likely to amount to anything. However, guys like Ronning, Meskanen, Gettinger are like lottery tickets. Neither Dan Girardi nor Cam Talbot was really supposed to amount to anything, but they developed nicely. Nowadays, the Rangers never seem to hit on those one chance in ten guys. Failure is expected in that game, but nothing but failure is not. On a different front, McDonagh and Sauer benefited nicely from their time in Hartford; that doesn’t seem to happen anymore either. It is truly bizarre that an organization with unlimited money, seemingly restricted only by a salary cap, is so stingy with player development. I do think the Rangers don’t understand the difference between the AHL and NHL. In the NHL, you need to understand what a player can’t do; in the AHL, you need to understand what a player can do. Listen Hartford did a damn good job of giving us 1 or 2 players a year that we could just plug in like clockwork through the last haf of the prior decade and the first half of this decade. Yes, they hit tough times from 2015 on, then again we weren’t really drafting too much from 2013 on. And this is why sending Lias there (Hartford) was a waste of time. Then compounding the situation, the Rangers called up Boo instead of Andersson. Boo was more ready for primetime then Lias and he has paid his dues in the iron league. So why not give him a shot in the bigs. If you look at some of the successful AHL rosters, they have a mix of youth and seasoned vets. Coaching can only take you so far. A club needs players that can show the kids the way. Having said that, I like to see the Rangers sign a player like Gilmore. He is thriving on the farm and can give the Rangers some depth going forward. I would understand it better if Hartford were a legitimate place to learn, but it’s not, not right now.